As an Esri Development Center, Z_GIS every year selects one top student based on his or her software development competence. This year’s nomination for the EDC Salzburg best student award goes to Caroline Atzl for her work towards an MSc thesis on "C&C View – Geo-enhanced COP Communication @ Local Level". Ms Atzl has selected a topic for her Master thesis, which addresses a set of timely and highly relevant issues in the wider field of emergency management. Starting from the ‘Common Operational Picture’ (COP) concept, she transfers this onto mobile devices for field use, and in the process of doing so has to adapt the common understanding of COP as such, as well as the user audience confronted with a COP. The thesis addresses a set of problems in the information flow and information access in disaster management, and subsequently defines a set of strategic and operational objectives summarized under the idea of a ‘geo-enhanced COP’. The main thrust is directed at establishing a COP as an interactive, mobile interface where not only information is presented to decision makers, but local information is collected on site and fused into the overall picture. Essentially, this is a marriage of COP with LBS. The Esri Development Center (EDC) program provices "recognition and special status to university departments that have exemplary programs focused on educating students to design and develop GIS applications". Congratulations to this outstanding piece of work, integrating software components through services across platforms and technologies! At the beginning of each year, the researchers at Z_GIS are looking back at their achievements throughout the previous year. The publication of our 'Annual Report' marks a milestone where we take stock and use this as a baseline for planning next steps. This past year’s big news has been Z_GIS itself: the University of Salzburg had decided to promote our centre to a full academic department, and to integrate the Austrian Academy of Science’s GIScience department into a team of researchers now certainly having reached “critical mass” to lead in the discipline of Geoinformatics. As a department, Z_GIS now will take a more prominent role in academic education: currently ongoing curriculum reform will retain a significant presence of geospatial methodology modules in the Geography bachelor, and focus on further strengthening the “Applied Geoinformatics” MSc, which due to English language of instruction has evolved into a popular, very international programme. On a doctoral level we now have reached record numbers of excellent students aiming at academic career paths worldwide. Our UNIGIS distance learning MSc and certificate continue as a unique and highly regarded continuing education framework with a “lifelong learning” focus. Many of these, and lots of other achievements are best visible at our annual GI_Forum and AGIT conferences, and for a younger audience at GIS Day. The new year of 2013 already promises to hold in stock even more changes and challenging developments, and everybody at Z_GIS is keen to stay on top of their game - contributing to leading the field of Geoinformatics and GIScience in its many facets, as a stimulating and innovation-rich interdisciplinary domain. Want to read our 'yearbook' in detail? Go to tinyurl.com/zgis2012 ... or just drop us a note for a hardcopy version. timeSPACE Workshop Completed in Nepal! The GIScience Institute of the Austrian Academy of Sciences and the Department of Geoinformatics - Z_GIS, University of Salzburg, Austria cooperated in conducting a regional workshop on 'Socio-Economic Adaptation Alternatives for Mountain Societies over Space and Time (timeSPACE)' in Kathmandu, Nepal from 16 to 20 January, 2013. The workshop was coordinated by Prof. Josef Strobl and Dr. Shahnawaz and hosted by the Central Department of Education (CED), Tribhuvan University (TU), Kathmandu, Nepal. Supported by the Eurasia-Pacific Uninet, this GIScience-based advanced training for teachers and professionals brought together 20 participants from Nepal, India and Austria. After the opening ceremony introduced by Dr. Krishna Poudel (CED-TU) and chaired by the TU Rector, Prof. Guna Nidhi Nyaupne, the participants attended a series of lectures covering the concepts of socio-economic dynamics of mountain societies with special emphasis on the Himalayas. The practical 'hands-on training' was given using ArcGIS software for modelling and analysing various scenarios of adaptation to changing economic and climatic factors over space and time. The TU Vice Chancellor, Prof. Hira Bahadur Maharjan, chaired the closing ceremony and distributed certificates among the participants. In his remarks he expressed thanks to GIScience Institute, Z_GIS and Eurasia-Pacific Uninet for organising this first ever International Workshop focussing on GIScience faculty development at TU and envisaged to expand academic cooperation with Z_GIS. 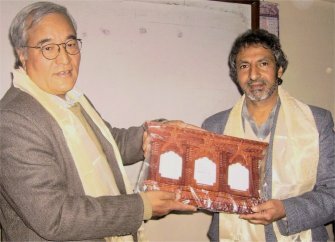 As a gesture of appreciation, the Vice chancellor adorned Dr. Shahnawaz with a traditional Napalese silk shawl and presented a miniature replica of a historical wooden window symbolising the traditional house-type of Nepal. The interdisciplinary GI_Forum attracts an international GIScience audience with the goal of promoting interest in translating theory, methods and techniques into a broad range of GI application domains. Young researchers are especially invited to contribute and discuss their research. Together with recognized scientists they will find a vibrant community from academia, business, and education ready to embrace new ideas and explore new research directions. GI_Forum runs concurrently with the highly regarded German language conference on Applied Geoinformatics – AGIT (www.agit.at). The two symposia share some 1200 participants, the innovative AGIT EXPO exhibit and stimulating social events. The GI_Forum communicates innovative research and learning in Geographic Information Science with focus on hardware, software, orgware and brainware for the GISociety, and their inter-relationships. We expect researchers from these fields to interact closely and benefit from each other. Keynotes by Sarah Elwood, Josef Strobl, Geoff Zeiss and Francis Harvey support the general topic. Keynote speakers will be available for additional discussion with young researchers. We will accept online submissions only at www.gi-forum.org. Publication will be both hardcopy and online (see http://gispoint.de, choose year 2012 and English language for the most recent proceedings). 14 days National Training Programme completed in Palampur, INDIA! The Department of Geoinformatics - Z_GIS, University of Salzburg, Austria was invited to contribute to a 14 Days National Training Programme on Applications of Geoinformatics and Remote Sensing in Agricultural Landuse Management. 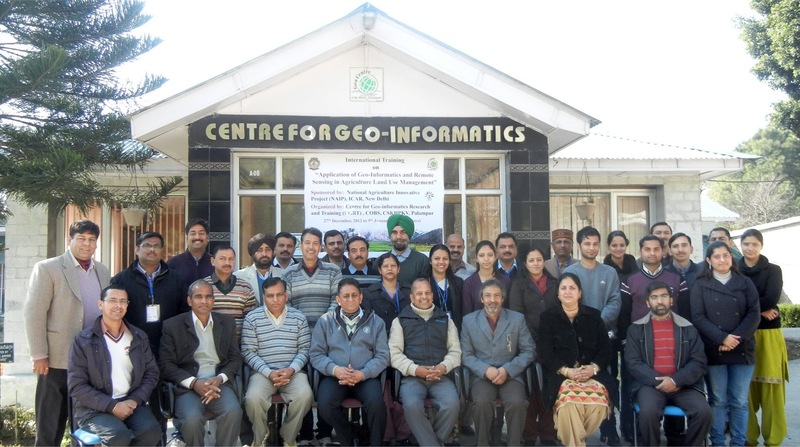 This event was organised at the Centre for Geo-Informatics Research and Training (CGRT) at the CSK Himachal Pradesh Agricultural University (CSK HPAU), Palampur, Himachal Pradesh, India from 27th December 2012 to 9th January 2013. The programme was funded by the Indian Council of Agricultural Research, New Delhi, India under the National Agricultural Innovation Project. Dr. Shahnawaz from Z_GIS was identified as the key expert to conduct the workshop for 17 faculty members from 15 Agricultural Universities located in 11 States of India. Selected special sessions were delivered by the visiting experts from India Meteorological Department, HP State Council for Science, Technology and Environment as well as by the internal faculty of CGRT. Dr. Shyam Kumar Sharma, Vice Chancellor of CSK HPAU, chaired the valedictory function and gave away certificates to the training participants. 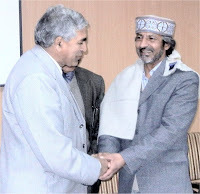 He highly appreciated the contributions of Z_GIS and honoured Dr. Shahnawaz with a traditional cap and shawl. The Vice Chancellor, the Director of CGRT Dr. (Mrs.) Sharda Singh and the coordinator of the training programme Dr. Ranbir Singh Rana expressed a strong willingness to strengthen institutional cooperation between Z_GIS and CSK HPAU and proposed to sign an MoU between the two institutions. Z_GIS honoured the proposal and the MoU will be concluded in the next weeks.